Auntie Beeb has announced an all new crew for the TARDIS. 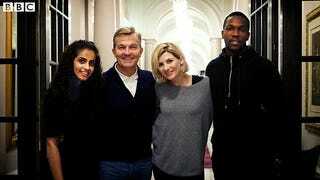 When Jodie Whittaker takes over as the Thirteenth Doctor Who in 2018, she will be joined by Bradley Walsh, Tosin Cole and Mandip Gill. Bradley will star as Graham, Tosin will play Ryan and Mandip will play Yasmin. Also joining the series in a returning role is Sharon D Clarke, MBE. They have also confirmed that the new series will be a ten week run of fifty minute episodes in Autumn 2018, kicking off with a feature length hour for the opening launch.